Carrying a means of calling for help when out on the water is standard for most Victorian boaters and many paddlers, but too many think a mobile phone and/or hand-held radio are sufficient. 'A GPS-enabled emergency position indicating radio beacon (EPIRB) registered with AMSA or a personal locator beacon are your best bet for getting help if things go wrong,' said MSV Safety Director Rachel Gualano. 'Mobile phones or hand-held radios might not work when wet and touchscreens may be unresponsive to cold wet fingers. Victorian boater James says he was tumbled out of his kayak by a regulation wave that caught him by surprise. 'Once in the water, it was hard to think straight and, as I got colder, I found that my fingers didn’t work so well. I realised that if I was going to set off my beacon it had better be soon. 'I started to think about my partner and how worried she’d be as I was well overdue by that time. Looking back, the right thing to do would have been to set off the beacon as early as possible. James did set off his distress beacon and a helicopter was dispatched. 'Based on my experience, my advice to you is always carry a distress beacon', James said. ‘Carry a distress beacon’ is a key message in MSV’s new boating safety campaign ‘Prepare to survive: Know the five’. Watch James tell his story and get more advice from AMSA and Maritime Safety Victoria. As Ms Gualano explained, one of the greatest risks to boaters and paddlers is unexpectedly entering the water, and then not being able to get back onto their vessel or to call for help. 'Our research shows that many boaters and paddlers tend to underestimate the risks and overestimate their capabilities. 'The 37 per cent of paddlers and 31 per cent of coastal boaters who reported that, on their last outing they did not carry any equipment to help them get back onto their craft, really needed to have a distress beacon with them. 'No matter how experienced you are, things can still happen that are outside your control. From 1 January 2021, float-free emergency position indicating radio beacons (EPIRBs) will be mandatory on certain types of domestic commercial vessels. This change to safety equipment requirements comes after a number of incidents in Australia and internationally where commercial vessels have sunk quickly and the master and crew were not able to deploy their EPIRB in time, resulting in a tragic loss of life. AMSA conducted extensive public consultation about changes to requirements for carrying float-free EPIRBs in 2018. As a result we are making changes to the National Standard for Commercial Vessels (NSCV) from 1 January 2019, with a two-year transition period. More information can be found about this change on the AMSA website. 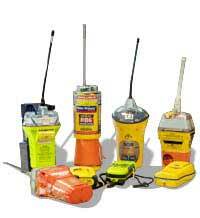 Have a look at our float-free EPIRB video to see how this will work for you. Beacon manufacturer Kannad Marine has issued a voluntary recall for the Safelink EPIRB model. If you suspect that you may have an affected beacon, you should not use the Safelink as the primary Search and Rescue beacon on board your vessel. Please register your ownership, location and contact details via the dedicated website: www.safelinkepirbsupport.co.uk. You can also read the Recall Procedure for further information. 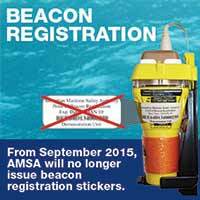 Did you know that AMSA has improved the beacon registration system. See our flyer to find out further information. Use your mobile, tablet or computer to register your beacon online. 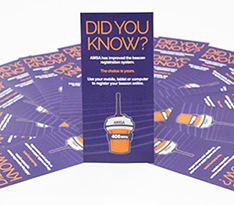 Find out more about AMSA distress beacons and MMSI in our new brochure. The Australian Maritime Safety Authority (AMSA) is urging owners of emergency beacons to dispose of their unwanted beacons correctly. 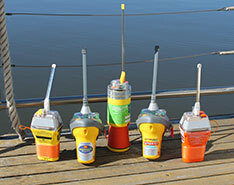 AMSA spokesperson Lisa Martin said emergency beacons can inadvertently activate if they are not correctly disposed, which often occurs when beacons are thrown in the rubbish and end up in tips. “Search assets and personnel tasked to look for beacons which are inadvertently activated may then be unavailable for a real emergency,” she said. Beacon owners should be aware that there has been a change in beacon disposal arrangements with Battery World. Free disposal is no longer available at Battery World stores and a small fee will now apply. Battery World marine spokesperson Vince Petruzzella said the company started collecting the unwanted beacons in 2007 as part of the transition to the 406MHz digital beacon. “Our relationship with AMSA and the importance of correct beacon disposal is still very important to us but due to the increasing number of beacons being disposed and associated labour involved, stores will now charge a small fee,” he said. Anyone who disposes of their unwanted beacon should update their details with AMSA to de-register their beacon. Details can be updated online at Beacons website or by phoning AMSA on 1800 406 406. The Australian Maritime Safety Authority (AMSA) will no longer issue stickers as proof of beacon registration from September 2015. This change affects vessel and aircraft owners who are required to carry a registered beacon under regulatory carriage requirements. The reason for this change is because Australian beacon owners have brought to AMSA’s attention a number of issues relating to stickers. As a result, AMSA will move to an easier and more mobile method of proving beacon registration. If you don’t have an email address or mobile phone, request a copy of your registration confirmation be sent to you by post and carry it with you when using your vessel or aircraft. Owners and inspectors will be able to enter the beacon’s HEX ID into a new beacon system on their mobile device to confirm whether the beacon is registered. Further details will follow closer to September 2015. What can I do to make my rescue quicker? Beacon manufacturer GME has issued a safety recall affecting EPIRB models MT400, MT401 and MT403. View the Product Safety Recall (PDF, 302 KB) for further information. Questions should be made directly to GME via recall@gme.net.au. 121.5 MHz distress beacons are no longer detected by satellite. You MUST switch to a 406 MHz distress beacon as soon as possible. 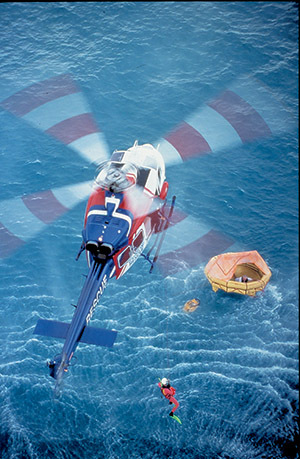 Do not risk your life by relying on a 121.5 MHz distress beacon. After 1 Feb 2010, old analogue EPIRBs and PLBs operating on 121.5 MHz are no longer licenced for use. 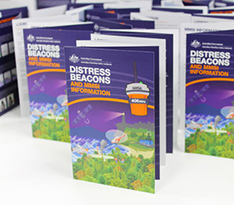 Registration of your 406 MHz Distress Beacon is valid for two years and can be renewed online.